Here are five essential insights we’ve learnt and which every games company needs to know when planning to launch in China. More tips and know-how available in our recently published free guide: How to Launch Mobile Games in China. China is the largest gaming market on the planet. It’s also one of the most challenging markets for Western developers to enter. Not only do Chinese gamers prefer particular genres and styles of games, but the whole process of localising and launching games in China means that it’s not a market you should approached lightly. Even for developers who optimise their games and gain approval to have their games in China, reaching end users can be a real challenge. Not only are there the distinct cultural and language differences to other markets, but there is also a big difference in how people use social media and the web. Unlike much of the world, where Facebook and Google tend to dominate, in China, these companies are largely prevented from operating. Not only have a trio of Chinese companies – Baidu, Alibaba and Tencent – grown to become the de-facto social and web channels, but they and other local companies have created an ecosystem of very innovative digital platforms. So any company that’s serious about launching in China needs to work with a company like Mobvista that understands how best to market a mobile game across these channels. So with that in mind, here are five essential insights we’ve learnt and which every games company needs to know when planning to launch in China. Although Android is the most popular platform in China, there is no Google Play store at present. To fill the gap, more than 200 different Android app stores exist making China probably the most fragmented market in the world. Although you don’t need to launch your app on all of them, it’s still important to target the top stores to get your game in front of as many people as possible. 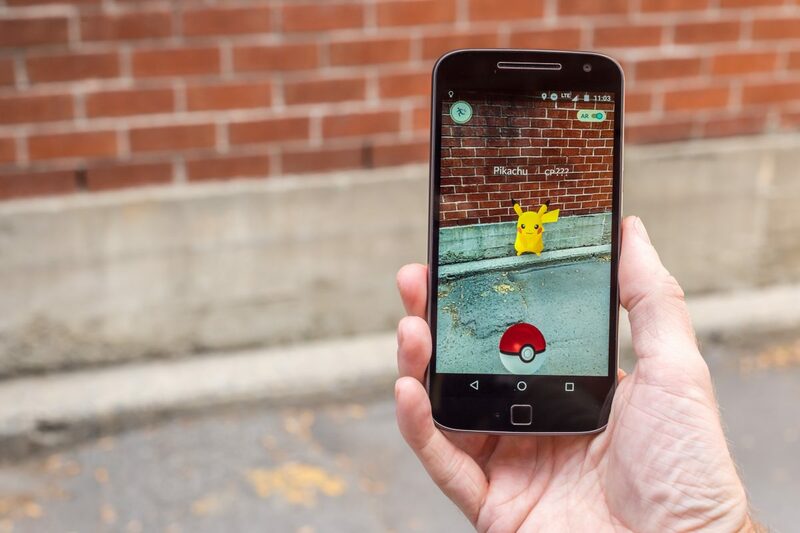 This can mean launching on forty or fifty stores – possibly more. For example, one publisher we worked with targeted on sixty different Android app stores. This level fragmentation makes launching Android more complicated than working with iOS apps, where Apple remains the only storefront. However, by working with a good local partner, it’s possible to have a successful game still. Localising you game properly is essential, and that means more than just cosmetic changes. Think about everything, from the game name, UI and colours though to the art style. For example, it can be quite common to change elements of the game levels to reflect more Chinese architecture. 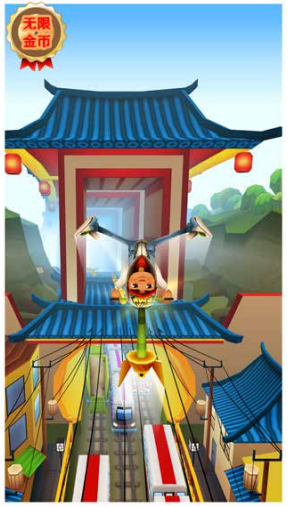 As you can see in these screenshots from Subway Surfer, the developers changed the buildings in the game to include elements of traditional Chinese architecture, and threw in plenty of red lanterns for good luck. Even small details can be important. Colours can have significant meaning in Chinese, with red, blue and yellow associated with the three elements fire, wood and earth. Red is also a colour suggesting good fortune, and on special occasions, Chinese people give each other red envelopes called hóngbāo. Understanding these nuances can make a big difference if they are incorporated into your game in a positive way. So Good localisation is about far more than just what language your game is in. It’s another unique aspect of launching a game in China; all mobile games must be registered and approved by SAPPRFT (the State Administration of Press, Publication, Radio, Film and Television of The People’s Republic of China). This rule was introduced in 2016 as a response to the huge increase in apps launching without any real oversight, and so regulations were brought in to ensure a higher level of quality. Apps that show too much violence or other themes deemed unsuitable are now rejected. In a way, this is similar to the approvals process that Apple mandates for all games launching on its stores. This approvals process can take several weeks or more. Simple games – typically puzzle or casual titles – take a minimum 20 days. But for other genres of games – especially from overseas publishers – 3 months or longer can be a typical approval time. All games and apps need to go through this process, both Android and iOS. However, there is an option for companies outside of China to directly launch onto the Apple App Store without the approvals process. Although it was assumed this loophole would be closed, it remains a viable way to launch your game in China – for now. Companies like Baidu, Tencent and Weibo have apps and services that are used by hundreds of millions of Chinese every day. Launching your game will almost certainly involve working with them on your marketing and advertising strategy. Tencent is the biggest and most popular. Its primary social platforms are QQ, which started as a messaging and microblogging services but has grown to include games, video and e-commerce, and WeChat, ostensibly another messaging app, but one that’s become ubiquitous throughout China for everything from work emails to the primary form of payment online and in stores. It’s no coincidence that Tencent has also become one of the biggest games companies in the world as well. Sina Weibo, or Weibo, is a micro-blogging platform that was launched almost ten years ago and became the first widely popular social media platform. Imagine a combination of Twitter and Facebook’s newsfeed. It lets users upload and share videos and photos, and as with Twitter, you can follow people’s feeds and re-share them. Baidu is a search engine that is to China what Google is to the rest of the world. Baidu Tieba is its online discussion forum; think something similar to Reddit. It is the largest communications platform in China, with users able to search for discussions and information on almost any topic. Toutiao is a relative newcomer, having only launched in 2012. It’s a news aggregation app that uses complex algorithms and AI to deliver highly targeted and personalised content from thousands of content partners. It’s particularly popular with younger professionals thanks to its clever blend of news and entertainment. As of 2017 it already had 120 million daily users, who on average spent more time on it than anything else – including WeChat. The last member of the big five is UC Browser, which is a mobile web browser from Alibaba. It’s designed to make browsing simpler, and incredibly data-efficient. That’s perfect for countries where mobiles are the main device for using the web, and where data can often be quite expensive. While UC Browser has a smaller market share amongst Chinese Android users than the default Chrome browser (17% versus 54% for Chrome), it has become very popular in other markets, with half of Indian smartphone users installing it. Overall, more than 400 million people currently use UC Browser as their entry point to the internet. All of these platforms are individually important, but it is about how they can be combined to create powerful marketing campaigns. 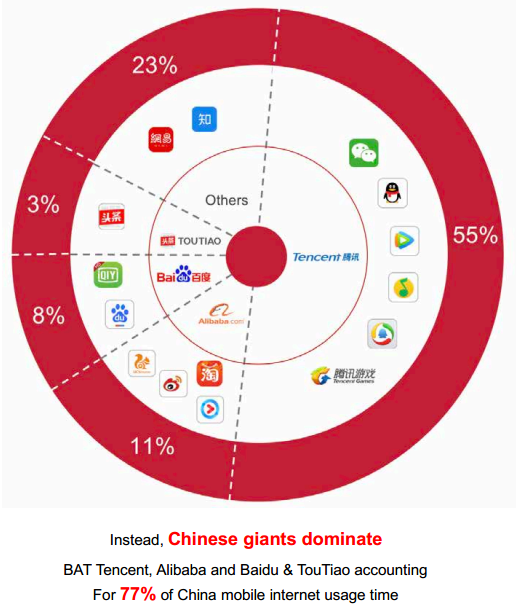 Most Chinese consumers will use several different apps and platforms every day for browsing, news, chat and e-commerce. One of the key reasons that games publishers work with Mobvista is for our experience and partnerships with these companies, so that the right channels are used to get the best results for your app campaign. Our final tip is not to underestimate the complexities of launching your game in China. Although China has become the biggest market for games in the world, it poses some unique challenges too. Aside from the differences we’ve already mentioned, China’s games market is fiercely competitive, with many hugely popular games that are not well known in the West. A survey we ran asking games publishers about their experiences of launching games in China found that 66% of the companies that responded had found it harder than they expected. For those games that make it to market, the rewards for success can be significant. But getting there is a process that requires careful planning, the right support from local experts, and the knowledge that you can’t cut corners.